The Windmill Trainer, aka The Perfect Circle, is a training system designed to teach the proper placement of the hand in the release zone. This training system is a great pitching aid whether you are working on basic mechanics or on the advanced pitching mechanics of the windmill motion such as the Fastball, Change-up, Dropball, Screwball, Riseball, and the Curveball. 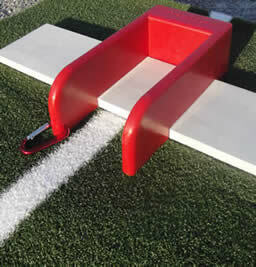 The Power-Push is designed to promote a powerful,mechanically correct forward push away from the rubber.The fact that it can also correct bad and illegal mechanics is double the benefits.We have designed the channel of the Power-Push to be long enough to promote a forward push away from the rubber,yet short enough to allow the pitcher to open her hips in the middle of her stride,not on the pitching rubber.Obviously we want the pitcher to open up,just not on the rubber.We promote opening up at the highest point in the pitch(Apex)which is more in the middle of the stride,not at the start,or on the rubber.The channel provides instant feedback to the pitcher,letting her know if she does or doesn’t push straight down the powerline.By providing a visual path for her push foot,she will better understand what is expected of her.All of this in a simple,no break polypropylene,lightweight product for only $49.99.That’s less than the cost of one pitching lesson! Get your pitcher started in the right direction with The Power-Push!!! !